The Union of Utrecht unites Old Catholic Churches with various historical origins at the international level through their bishops. It was founded in 1889 by the coming together of the Old Catholic Churches of the Netherlands, Germany and Switzerland. The Old Catholic movement in Germany and Switzerland grew out of protest against the decisions of Vatican I. Soon after they started to organize as dioceses they made contact with the older Church of Utrecht in the Netherlands. In the first years these contacts were not free of tension. The Church of Utrecht assisted the Old Catholics in building up their churches: In 1872 the Archbishop of Utrecht confirmed the children of excommunicated Old Catholics in Germany and in 1873 the Bishop of Deventer consecrated the first German bishop, J .H. Reinkens, in Rotterdam. However the speed with which the German and Swiss churches introduced reforms (e.g. abolition of celibacy) was difficult for the Dutch. They began to question the catholic character of the Old Catholic movement. As the Swiss bishop Eduard Herzog and the German bishop Reinkens took up contacts with the Anglican churches of Great Britain and the United States, these doubts increased, as the Dutch Church at this time was not able to recognize the validity of Anglican orders, and therefore also the catholic character of these churches. Only in 1925 the orders were recognised by the Dutch bishops. Towards the end of the 1880s the desire of both sides for a closer relationship prevailed. For this purpose the five Old Catholic bishops met on September 24, 1889 in Utrecht: H. Heykamp (Archbishop of Utrecht), C.J. Rinkel (Bishop of Haarlem), C. Diependaal (Bishop of Deventer) J.H. Reinkens (Bishop of the Old Catholic Church in Germany) and E. Herzog (Bishop of the Christ Catholic Church of Switzerland). During this meeting they constituted themselves as a conference and declared firmly that the churches which they represented and led were in full communion with each other. They also issued a Statement to the Roman Catholic Church in which they set forth the ecclesiological principals that they were guided by. · The "(Utrecht) Declaration", in which the principles, based on the early church, of the unified Old Catholic bishops and their churches were expressed. Especially the 'Agreement' and the 'Declaration' have become important for building the Old Catholic identity. The second has received a special position. It is this historical document which the churches 'confess' through their bishops, and to which each new bishop of one of the member churches must assent by his signature at his consecration. Although the 'Utrecht Declaration' has never been revised, the 'Agreement' and the 'Regulations' were redrafted in 1952 and 1974 on the basis of experience and the growing leadership function of the International Old Catholic Bishop's Conference. A third revision was commenced in 1996. It resulted in the "Statute of the Old Catholic Bishops United in the Union of Utrecht" which has been brought into force at the beginning of 2001. The 'Agreement' has become the 'Order' and the 'Regulations' the 'Rules' A preamble was added before these two section that presents, in concentrated form, the ecclesiological understanding of itself that the Union of Utrecht has developed during its historical development and the theological reflection that has been part of that development. 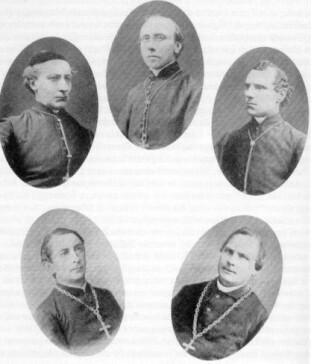 In 1890 the episcopal administrator of the Old Catholic Church of Austria (at that time still the Habsburg monarchy), Amandus Czech, joined the Union of Utrecht. The process of creating a diocese took longer here due to the disapproval of the imperial government. In fact the first bishop was not elected until after World War I. When the Habsburg monarchy was dissolved in 1918, the earlier diocese was divided into an Austrian diocese based in Vienna and a Czechoslovakian diocese based in Warnsdorf. Both churches that resulted from this division are now separate local churches in the Union of Utrecht. Also as a result of the dissolution of the Habsburg monarchy, an independent Old Catholic Church was founded in Croatia in 1923. However this church has never recovered from the turmoils of World War II. Although it has been recognized as a member church of the Union of Utrecht since 1924, it no longer has any functioning diocesan organization. The responsibility for the two remaining parishes lies with the IBC, who carry out their jurisdiction by way of a delegate. In 1897 resp. 1907 the Polish National Catholic Church in the USA and in Canada, founded by Polish immigrants were accepted into the Union of Utrecht. This member church started their independence existence because of cultural and ethnic reasons. The church left the Union of Utrecht in 2003 because of the ordination of women which was invented ba the Western European Churches. The Old Catholic Church in Poland, created as a missionary diocese of the PNCC, became independent in the 1950s and is since then a member church of the Union of Utrecht. It has three dioceses: Warsaw, Cracow, and Wroclaw. The Old Catholic Church of Slovakia was recognized by the IBC as the youngest member of the Union of Utrecht in 2000. The division of Czechoslovakia into two separate countries caused the division of the church as well. This church had to be excluded in 2004 because the episcopal administrator and bishop electus at that time had been consecrated by an episcopus vagans. In Europe there have always been areas in which Old Catholic parishes have been formed that have not however developed enough that they could have been formed themselves into dioceses. These parishes are given episcopal oversight by so-called delegates of the IBC. The delegates are bishops of other dioceses that are commissioned by the IBC, in agreement with the effected parishes, to exercise episcopal oversight in these areas. This includes parishes in Italy, France, Denmark and Sweden.